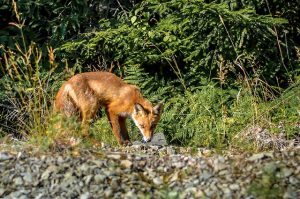 The red fox is a small wild dog capable of hurting small pets like cats and small dogs, when you need fox removal, Indianapolis residents can turn to Affordable Wildlife Control. A fox will have a pointed muzzle, prominent ears and a long, bushy tail tipped in white. They appear yellowish-red from a distance. A closer look will reveal the white belly, throat and inner ears. Other color phases occur, but they are not common. The long guard hairs making up their colorful pelt cause them to appear larger then they actually are. The average adult weighs from 8 to 14 pounds. Red fox seldom use dens except for rearing young. A search for a nursery begins in December when the pair inspects burrows and previous fox dens. The den selected may be located in the open or in woods. It is well-drained and usually has at least two entrances. One litter is born each year in March or April, Litters may range from one to twelve. The average number of pups is five or six. Newborn fox are blind until nine days old and are constantly attended by their mother until several weeks old. The male delivers food to his family during this period of confinement. The pups first venture outside the den under guidance of parents when they are a month old. The next two months are spent with parents learning to survive on their own. The family group disbands in late summer, living separately until December. If a fox is around, your cat may be bait!